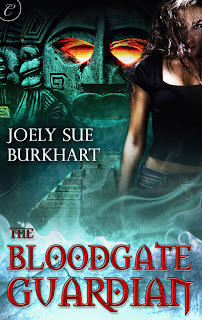 I'm talking about writing multi-genre books at the Happy Endings blog today. 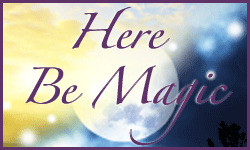 Come check out my first post at the Here Be Magic blog! Also, Congratulations to JenM who is the winner of a copy of Joely Sue Burkhart's book, Lady Doctor Wyre. Please email her at joelysueburkhart(AT)gmail(DOT)com! 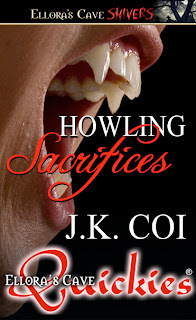 Don't forget to pick up HOWLING SACRIFICES, out today from Ellora's Cave! What happens to a young and naive Canadian woman traveling alone on a particularly evil night in the Scottish Highlands? She’ll get a lot more than she bargained for when she wishes for an adventure and finds herself part of a bloody pagan ritual…and inexorably linked to a wild and dangerous wolf. Wary about revealing her destination to a stranger, Lucy hesitated. She was probably overreacting by imagining that she’d unwittingly climbed into a four-wheeled version of the boat of Charon with a serial killer, but she nevertheless felt intimidated by this man’s overwhelming dark presence. In fact, everything about this trip made her nervous, and even though she was no doubt perfectly safe, it was probably best that she didn’t tell him too much. Dougald chuckled, a deep bass rumbling from the darkness, raising goose bumps on her skin half from jitters and half out of an absurd compulsion to lean forward and search the shadows for the face that belonged to such a mysterious, powerful voice. She tried to ignore the impulse, torn between the contradiction of fear and temptation. Lucy let out a long sigh and a breathy little laugh, embarrassed that she’d been so transparent about her misgivings. “Sorry. I know I’m overreacting. I think it’s the time of night.” She spared another quick glance out the window. The darkness was so complete she shivered. “Witching hour of the winter solstice,” he murmured in a low voice. His words only compounded Lucy’s feelings of foreboding. Cold slithered up her spine and settled over her heart as she gazed out the window once more. On one side of her, the narrow road they were traveling had been cut out of the mountain. It wound across the bumpy terrain in lazy S’s. On the other side of the carriage, craggy moors had given way some time ago to tall trees that hid even the brightest stars. There were no road lamps or markers to light the way. Anything could leap out into their path at any moment and they’d never see it coming. It was all just a little too spooky for a girl who’d been living in Toronto for the past fifteen years, where no street went without a neon sign or two and there was never a time of day without some jarring noise ringing in the air to remind you that you were never truly alone. “Every corner of Scotland seems to have some eerie ancient mythology attached to it. It’s a little unsettling,” she admitted sheepishly to Dougald. I've always listened to music while I write. Some books need several different songs that help me invoke the images or emotion I'm trying to create. Thanks to my first fantasy trilogy, I can't listen to Kiss From A Rose by Seal or (Everything I Do) I Do It For You by Bryan Adams without getting teary-eyed. I've got everything from Nickelback to Apocalyptica to country - yes country music! - on my playlists. But only recently have I added movies to my inspiration process. My next Carina release, Golden, was inspired by the movie Curse of the Golden Flower. I happened to catch a few minutes of the movie at bedtime one night, and I ended up staying up way past midnight (even though I had to work the next day!) in order to watch it. I DVRd it and watched it over and over, at least half a dozen times, and I knew I had to write a story based on Imperial China. Now that the story is contracted, I've watched CotGF at least four times while working on edits. The music, the scenery, everything speaks to me. I get chills while watching it. I even dream about it! 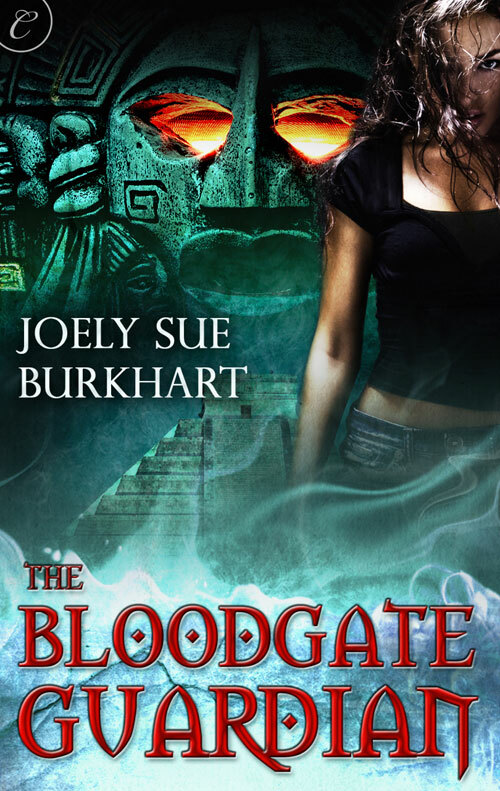 Indirectly, The Bloodgate Guardian was also inspired by a movie: Stargate. I've always loved pyramids, but everybody's done Egyptian stories. What about all those fantastic Mayan pyramids in Central America? Add in blood and human sacrifice with interesting mythologies, and I'm there! Music and movies might be expected, but I bet you'll be surprised to hear that I was inspired by Mrs. Giggles' Regency Drinking Game for my upcoming Samhain release, Lady Doctor Wyre. I was reading her list and giggling, naturally, and the thought came to me: how ridiculous would some of these be if the heroine and hero exchanged roles? I mean, just think of how much fun I'm going to have with debutant virgin heroes and rake heroines? I can't wait! I've just sold a fantastic, chilling short to Ellora's Cave's new Shivers line, and it's scheduled to be out THIS MONTH!! From EC's new Shivers line, Howling Sacrifices is the story of a young and naive Canadian woman travelling alone on a particularly evil night in the Scottish Highlands. She wished for adventure and excitement, but Lucy will get a lot more than she bargained for when she finds herself inexorably linked to a wild and dangerous wolf. Join me at the Vixens Blog for the three things I HAVE TO HAVE when starting a new writing project, and tell me what your writing superstitions are.